Post Ph.D., Pharm.D, or MS (or equivalent) Degree in Clinical Pharmacy. Post Ph.D., Pharm.D, or MS experiences of at least 2 years at a similar hospital. Valid license to practice from SCHS. 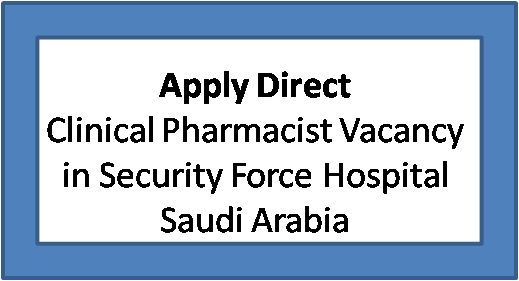 At least two (2) years experience in Clinical Pharmacy or one (1) year in ASHP accredited clinical residency program. The practicing clinical pharmacist should have professional knowledge regarding Pharmacokinetics and pharmacotherapy, to be capable to provide definite patient outcome and quality of life. Must exhibit a communication and interacting skills, to work with other health – care professionals as a one team, focusing on the patient care. Demonstrates self-motivated ability to update his medical information in his field, by maintain searching state–of–art therapeutic guidelines from reputable medical organizations.